I am Sir Real, and this is Sir Real's Underground Comix Classix. This site is my collection of Underground Comix (and a few like items). It is not an Underground Comix Price Guide. It is not a Guide to Comix Reprints. AND NOTHING HERE IS FOR SALE! It is just my collection. WHO HAS THESE LICENSE PLATES? 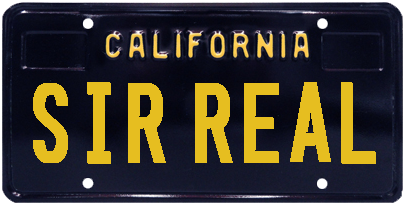 Someone in California appears to have these personalized license plates. I sure would like to know who. I wouldn't mind attempting to negotiate for either of them. I have just the car to put one of them on. I originally created this site to help me easily determine what I had in my collection. When I'm out buying, either by online auction or other location, and I needed to know what particular edition or title I already had, I could refer to this site. I have purchased duplicates in the past, and I try to avoid doing that. My site has helped me keep things straight, and is readily available to me, no matter where I am. It is not a fancy site. Pretty bare-bones, actually. But for a collection site that was only intended for my use, it gets a pretty fair number of hits every day. As a side-effect, it has vaulted me into the little-known world of Underground Comix Collecting. UG collectors are generally a tight lipped bunch, gleefully sitting on their hoard of comix. For some reason, the underground genre has recently started to enjoy a small amount of popularity. As a result, I've been contacted by a number of the original artists, and a large number of fans. If you're a UG collector, want to be a UG collector, or just have an Underground Comix question, your best bet is to visit the wealth of Comix knowledge at the Comics Price Guide Forums. Home - You're looking at it. This link will always return you here. Who Is Sir Real? - This is my little explanation of how I got into Underground Comix Collecting. Comix Blog - Yeah, I keep a blog, too. Its not much, but I find it worthwhile. And you can leave comments there, too. Comix Links - This is a collection of Comix-related sites. Mostly artists and collectors. Plus my own link-banners. If you're an artist and have a website, let me know and I'll add it to the list. If you're a collector with a site, again, let me know. If you're a collector and don't have your own website, well, why NOT??? Now, if you happen to be a dealer/seller of underground comix, I'm adopting a new policy. I'm not really in the business of increasing your net worth, no matter how much of my money I've spent at your place. Advertising is not free, but we can talk. I'm pretty reasonable. Vanity Page - My small collection of renditions of myself as done by a variety of artists. If you'd like to contribute, I'm MORE than happy to display it here. Numeric, A-Z - This is the core of my comix collection, sorted in alpha order. Comix Series - Some comix ran in long series, like Rip Off Comix, or American Splendor. I figure that any comix that had eight or more titles constituted a series. Books - Not everything is comix. This is where all the comix-related books are stored. Posters - I'm using this as a pretty broad category here. Posters are here, plus portfolios, original art, and pretty much any single, flat item. 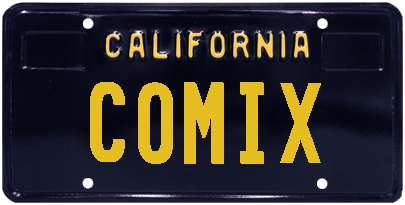 Comix Related Stuff - Here you'll find videos, trading cards, munchie bars, and other stuff. Non-Undergrounds - These are comics that should have been undergrounds, or are done by artists that started in the underground. Wants - While there are probably hundreds of comix that I want, these are comix that I've got my eye open for. If you've got something I want (or think I might want), feel free to drop me a line. I'm pretty discriminating and tough in dealing with individuals. I've been burned before, but I am honest in my dealings. If you do write to me, please make sure that your subject line at least has "Underground Comix" in it. Otherwise it stands a good chance of being tagged as spam and deleted. I am always open to suggestions as to how I could improve this site.